This fall’s great adventure for D&D is the Tomb of Annihilation, and I picked up the book with some interest. I like the idea of a hex crawl having the players to travel deep into jungles searching for lost cities and ancient ruins, but without finding everything on their first go. Instead, they will have to make multiple journeys mapping the jungles bit by bit, and between expeditions they have a home base in a large harbor town. I like this. I do not care much for the backstory with the curse killing people, who has been resurrected and making the raising of people impossible. It is a fine, grandiose plot, but not one, that I care for, and neither does the jungles of Chult nor Forgotten Realms have my interest. 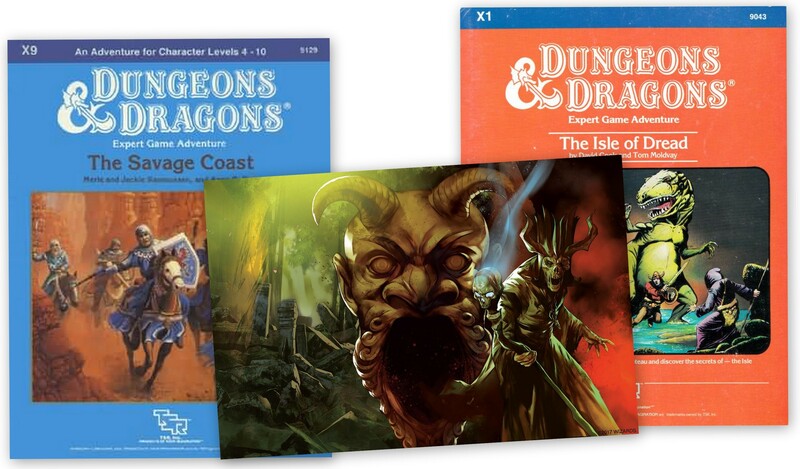 That is mostly because, when it comes to D&D settings, my favorite is The Known World or Mystara. So, I want to run this campaign, and I want to run it in the Mystaran setting. But where to place this wonderful, empty hex map filled with deadly wonders and ancient secrets? An obvious choice would be the major hex crawl adventure for D&D becmi, namely The Isle of Dread from module X1 The Isle of Dread (1980), which is an obvious choice, and I could simply just use the map from X1 with the adventure from Tomb of Annihilation, but I have already explored The Isle of Dread, and it could be interesting to try some other area. Tomb of Annihilation itself suggests The Savage Coast, but they are probably not thinking of module X9 The Savage Coast (1985) but rather the (sub)-setting later published for AD&D 2nd edition The Savage Coast (based on the expanded material from the articles Voyage of the Princess Ark), but even though the region is called ‘savage’ it is far from unexplored or inhabited, and adapting Tomb of Annihilation to this region would require a lot of work, if I want it to stay true to the Mystaran setting. There is, however, an interesting alternative. South of the Sea of Dread lies the continent Davania, and though parts have scarcely been colonized by Thyatis, it is at least from the view of The Known World unexplored lands, that are vaguely known, and near the Serpent’s Peninsula on the opposite side of The Serpent’s Sound the continent of Davania is somewhat shaped reminiscent of Chult area from the ToA book, which means that I can use the map from ToA without it being too far off, and that saves me time. The coastal city being used as a base in ToA will be replaced with its Mystaran equivalent – there is actually one on the continent of Davania in the right place – called Kastellos. The name could indicate a Thyatian origin, but its position is just next to the Yawdlom Divinarchy, which means that I can keep large parts of the material from ToA and add materiale from the box set Champions of Mystara, which describes The Serpent’s Peninsula and The Yawdlom Divinarchy. The Mystaran Tomb of Annihilation plays out in the harbor town Kastellos on the continent of Davania. The town was originally a Thyatian colony, but Thyatis was unable to maintain its control of the city, and soon a large part of the population were newcomers from the Yawdlom Divinarchy seeking adventure. The city still has a large minority of Thyatians, and both traders from the Minrothad Isles and Thyatis pass by regularly keeping Kastellos in the orbit of The Known World-region. Besides Thyatians and Yawdloms, Kastellos is home to a thriving colony of wererats, who arrived from Karameikos, as well as a large group of skygnomes stranded here, when their skyship crashed, and they are waiting for the flying city of Serraine to pass their way again. Elves are rare, but the few that are here, are mostly forest elves from Karameikos and sea-elves from Minrothad. Dwarves are here as travelling artisans, and the few hin finding their way here, are mostly hin pirates from the coasts of The Five Shires. Small groups of tortles from the Savage Coast also call the northern coasts of Davania for home, and they can be seen in the streets of Kastellos. Davania is home to nomadic tribes of Rakasta – some are related to the Rakasta from Isle of Dread – and Lupins. This should give a hint as to which playable races will be used in the campaign. I am right now in the process of adapting ToA to run it in the Mystaran setting. This is first post in a small series of posts about adapting ToA, and fitting its backstory and plot into the existing framework of Mystara. You could also do the adventure in the areas south of Atraughin, granted the Tiger Tribe is extremely hostile so you’d have to wing the first city a bit. That is an interesting choice as well. In such a case I would probably use a Darokinian town near the Mapheggi Swamp as a base, and then have the players hex crawl their through both the swamp and the lands of the Tiger Clan – and I might even add a connection to Hollow World (perhaps as a explanation for dinosaurs suddenly raoming the lands – and that might even be part of the new backstory and hook: Dinosaurs are roaming southern Darokin – investigate the swamp and the forests to find their origin).